In this page you can find my collection of Java utilities, available to download for free, under a BSD-like license. Here are some swing components that you can use to improve your JFC/Swing experience. 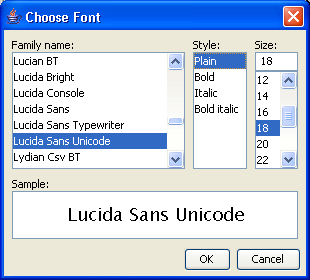 Something I've always missed in Java is a standard Font selection Dialog. 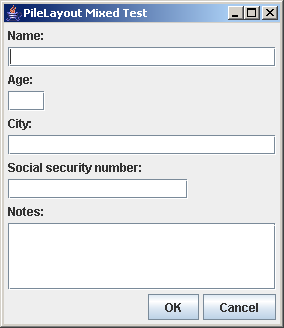 My JFontChooser permits to select a font with minimum effort for both the user and the programmer, in a standard layout. Here is the source of a sample program, to learn how to use it. 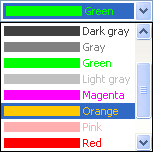 Something I find handy to quickly select a color without opening a big and complex ColorChooser dialog box. My JColorComboBox permits to pick a color from a colored drop-down list. To run the samples double-click the Jar file (or launch java -jar swing.jar). Click here to browse the documentation on line. Standard Java layout managers are very complicated but not so good even at simple tasks. I've developed some layout managers to ease GUI development. To better understand how it works see How to use MeshLayout. To better understand how it works see How to use PileLayout. 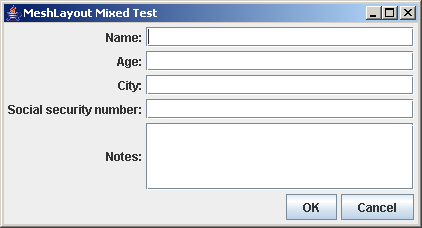 To run the samples double-click the Jar file (or launch java -jar layout.jar). For any question, clarification, bug or typo, feel free to contact me by e-mail. *  Copyright © 2006, 2007 Roberto Mariottini. All rights reserved. *     this list of conditions and the following disclaimer. *     appreciated but is not required. *     be misrepresented as being the original software.